Sally Phillips, the head designer of her namesake label has been creating high quality and unique designs since 2000. Releasing two collections a year, the creative pieces embody elegance and creativity. Sally has built up a loyal following of clients who share her vision and invest in well-crafted and wearable pieces. Just last year, she presented a solo show in the 2015 Adelaide Fashion Festival that was styled by Nicole Bonython-Hines of Elle Magazine. Sally has always believed in designing for the women who needs pieces that are easy to wear and practical but also are different and inspiring. Her designs are modern and edgy with bold silhouettes suited for that strong women who knows what she wants. The Sally Phillips women is free spirited and daring which is exactly what you will find in her Spring/ Summer 17 Collection. Guests including media and clients sipped on D+B Pour Les Amour sparkling wine from Bird In Hand and were served small chicken and leek pies, mediterranean prawns with feta and red pulled pork sliders by Indulgence Food Design. 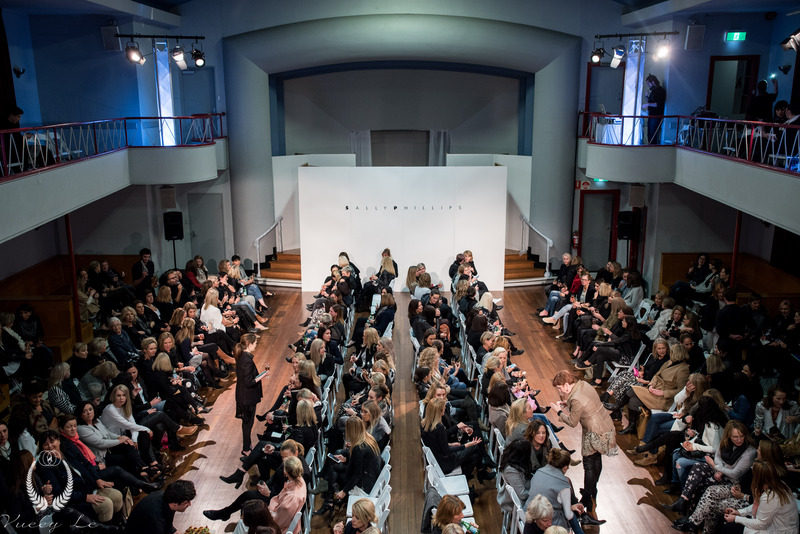 The runway soundtrack was mixed by Filip With An F and the show took place inside the historic and grand Burnside Ballroom. Each model wore simple and elegant and simple sandals by Country Road and many of the outfits were accessorised with black or white neckties and tribal necklaces. The hair was styled in sleek half top knots and the makeup was kept quite natural and dewy. Sally Phillips essentially designs a complete capsule wardrobe each season and the upcoming collection follows this design aesthetic. From blazers to shorts and from dresses to detailed boyfriend shirts, the collection has all the classics with a special twist. A black and white aztec print featured quite prominently in the collection which Sally says is quite “print focused”. The asymmetrical hemlines on tops and dresses floated elegantly behind the models as they glided down the runway. Bell sleeves were added to tops and classic blazers such as the Olivier Blazer, for a vintage, seventies feel. Loose boyfriend shirts such as the Loochia Shirt and culottes along with distressed denim and chambray shirts such as the Jilla Shirt also featured. A pink, colourful print seen on the Zephora Dress and a red and white print seen on the gorgeous Alula Dress are also present in the collection and can be worn as a matching set, with basic colours such as black or white or with other prints that intentionally clash. Black and white stripes also feature in the collection and would be perfect for those who prefer a more monochromatic look. Cut out shoulders in several of the shirts such as the Estelle Top caught my eye as it is a very flirtatious and feminine way to cover up but stay cool and comfortable at the same time on those hot summer days and nights. Other pieces, such as the Antonetta Smock Shirt, drew attention to the shoulders and had unique detailing, almost like a thick Epaulette (ornamental shoulder piece used in the armed forces for defining ranks, similar to fringing) adding structure to the loose shirts which are a wardrobe staple and flatter pretty much any body type. Sally’s collections are ‘very boutique’ and exclusive with the label preferring to keep it that way. The clothes are made locally or interstate, supporting the Australian fashion industry and its high quality. The collection made myself, and I’m sure many others wish we were somewhere sitting on a beach in Mexico or sunning ourselves on the deck of a cruise ship in the Mediterranean Sea. Sally Phillips’ S/S 17 collection will be presented in Adelaide in private showings by appointment only by Sally and her team of stylists for two weeks in her studio. To make an appointment call (08) 8379 2232 or email Sally at sally@sallyphillips.com.au.